It is known that about 20 percent of healthy individuals are dealing with warts that take about 3 months to clear up, but some people (like 60 percent of them) wait for their warts to clear up for two years. We can say that treatment is not always needed. Warts can cause a lot of pain and unpleasantness at, which results with the urge for an intervention. We are lucky that nowadays there is a variety of treatments to choose from and we have chosen the best ones for you. The most important thing is to pay attention to boosting your immune system. This is something you can be done by taking foods and supplements filled with zinc and vitamin C.
Warts are small hard growths that appear on the skin. They are benign and often appear due to a virus infection. In order to successfully get rid of your warts, we should discuss the type of the ugly grow out you have. These are the most common as the name tells us. They can be noticed on the hands. They are papules with a skin color and quite the rough surface. Often appear on the back of the hands or legs and are smooth, yellowish brown papules that are flat-topped. Represent an infection that is a combination of the flat and common warts. Warts that can be seen under your fingernails and also your toenails. Usually appear on the soles of your feet. They resemble callouses. Warts that look like grouped plantar warts. There are many useful methods that are effective in getting you rid of warts that are a big issue for you. Let’s check them out. Salicylic medication has more success when used along with freezing treatment. The name of this treatment is cryotherapy. Talk to your doctor if he is willing to let you try this before trying out another treatment. Salicylic medication should be used on daily basis. To add up to the freezing treatment, cryotherapy is known to be painful and also take up a period of two weeks.This method removes the wart completely by freezing the infection using liquid nitrogen. This practice works in the way that it triggers blisters which are appearing around the wart, so when it falls the wart is gone too. This method needs regular weekly checkups until the warts are disappeared for good. The immune therapy uses various mixtures and medications to encourage your system to fight against warts. Warts will probably be injected with an antigen that will destroy it in the end. Usually, a minor surgical procedure is enough for warts which are cut with an electric needle, to disappear. This process is quite painful so for the spot to be numbed is definitely required.I can also leave you a scar, just like any surgery so first consult a doctor and think about it before going forward with this. Laser surgery uses light or lasers and burns the wart but its effectiveness is not seen enough and it surely causes pain as well as scarring so as we said it’s best to consult a professional about going forward with all of this. There are a couple main options that you can choose from. They are always directly put on warts. There are imiquimod, podofilox, and podophyllin. Podophyllin is a resin that’s plant-based and completely destroys the tissue of the wart. You need to talk with your doctor before trying this method. Podofilox consists of the same compound as the others but can be applied safely by you or your friend. Trichloroacetic acid is a treatment that can burn off warts, but this should always be performed by your doctor. Do it yourself, off the store wart removers will surely not help you if you use them on such a sensitive area. It is believed that it can cause greater pain and irritation. If you decide to get rid of warts surgically, have in mind the several options that can help you remove them. If you happen to be pregnant during this process, your baby will be exposed in the time of the delivery so surgery is bound to be very needed and obligatory. The two most logic options are cryotherapy and surgical removal where the doctor simply cuts warts off. Other options are laser treatments or electrical burning off the wart. If you decide for cryotherapy, you will most definitely need repeated treatments. However, the unfortunate side effects are severe pain and swelling. If your choice is electrocautery, you will certainly have problems with pain and swelling afterward. For surgery, you will be under some kind of anesthesia so it is possible for you to feel sore after the procedure. As we know laser treatments are costly and not simple at all The side effects here are also scarring and pain. All of the options for treating genital warts are painful, leave scars, and are quite nasty routines. We came across many powerful and natural methods that will help you in the fight with warts permanently. Here is our list of some of the ways that will definitely be helpful for you. Sounds a bit odd but this old Chinese method deals with warts in a thing called a “smoke box”. The smoke box is contained in smoke from leaves from a tree called Populus euphratica. – Try to find a buy leaves from the Populus euphratica to give them a try. – Light them in a controlled environment and leave them to burn for a short period of time. – Cover them with something so that the oxygen sack can smother the flames. – Then put your hands or feet at six inches above the leaves and leave the smoke go through your feet where your warts are for about 15 minutes. You should be very careful. Don’t get too close to the burnt leaves while there’s still smoke. The reason why this method is efficient is that the leaves are filled with compounds that are antiviral such as salicylates. It works exactly like cryotherapy. As a research has shown, duct tape is more effective than cryotherapy.About 85 percent of the patients who used this method ended up being free from the infection, in comparison to the other 60 percent that underwent cryotherapy. Most of the warts that were healed with this method disappeared in less than a month as opposed to the cryotherapy group which needed one more session and another two weeks for full recovery. Another benefit is that children that have warts find the duct tape less scary. In order to use the duct tape, you should cover your warts for six days, soak it in water after and gently get rid of the dead tissue by leaving it exposed for about 12 hours. This process should be repeated until you no longer have warts left. 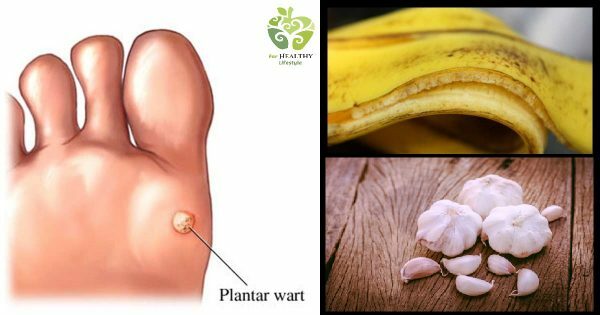 Believe it or not, garlic and banana peels are not only for bug bites or pimples can be very effective when it comes to treating warts.Before covering your warts with banana peels or a garlic patch put four drops of tea tree oil on warts. Then, cut the peel, and put it on the wart. You should do this every night before going to bed. This method should be done for about three weeks which is quite enough to solve your wart issue. Silver nitrate is an ointment that you can buy or in the form of a solution that you can put directly to warts. This method is a very beneficial and successful method. Zinc can also be found as an ointment that is ready for you to put it on the wart. A typical wart ointment that contains about 20 % zinc oxide. It should be put on the affected skin two times a day for a period of about three months. You can also take distilled water and add 5 or 10 % zinc sulfate. Use this solution three times a day for a month. Another convenient method to treat warts naturally is by using essential oils. The most typical ingredients used for this method are as tea tree, thyme, eucalyptus, oregano, lemon, oregano, etc. You should make a mixture out of only one drop of frankincense as well as oregano with coconut oil for thickness. Put the mixture directly to the wart for about 2 weeks or a month – depending on how long it takes for the wart to completely vanish. On the other hand, for genital warts try frankincense oil and tea tree and use it the same way. Apply the mixture until warts vanish. Always use Q-tips. Usually, people who deal with warts experience a lack of zinc.That means that this method tends to be very useful. 10 mg of zinc sulfate per kg took orally every day is more than enough. This method should be repeated for 6 months. This treatment represents an alternative practice that usually needs the smallest amounts of an active ingredient to help in the treatment of some sort of a disease.This type of treatment involves 25 medicines. You choose the right medicine depending on the type of warts that you have. Common homeopathic medicines consist of nitric acid, silica, antimonium crud, etc. Herbs like for example astragalus root, elderberry and echinacea can help your organism to fight warts by itself. The antiviral herbs are able to make the development of viruses slower as well as boost the immune system. Boosting the immune system will help your body to function excellently on its own. This is a harmless and useful method in your struggle with warts because it not only helps your immune system but stops you from going through all of these painful and unnecessary surgical methods. Anything that is helpful with boosting your immune system is capable to help you out fighting warts because warts are in fact viral infections. Deficiencies in nutrition like low levels of zinc in your system are the cause for the appearance of warts. We give you a list of the foods that you can eat that not only will be helpful for your general health and organism but will also help you out with the treatment of warts. Foods rich in Vitamin C – Any citrus fruits, strawberries and bell peppers that you add to your diet will help your immune system out through any fight it faces. Foods high on Zinc – Zinc is of crucial importance your immune system. Try eating foods with lots of zinc. Chickpeas, pumpkin seeds, etc. Probiotic foods – Vegetables that are fermented like live-cultured yogurt and kimchi, as well as Greek yogurt (milk of goats or cows) are enriched with good “germs” that your body can make good use of. Green leafy greens – These vegetables are filled with vitamin A as well as minerals. Foods high in selenium – Selenium is a crucial antioxidant that helps our organism An example of foods that are rich with the antioxidant are Brazil nuts. Raw cheese — Sheep’s milk, goat’s milk, and soft cheeses are very rich with probiotics. Goat’s milk kefir / Coconut kefir — These beverages are very high on probiotics. The milk is proved to be richer than the coconut one. They’re made with fermented goat’s milk or coconut juice with some kefir grains. The two options provide great probiotic intake. Kvass — This is a very common drink, especially in Eastern Europe. If you know someone who has warts try to avoid any contact with that person. If you have warts, don’t touch or scratch them, because it is an infection and if you do this you will only make things worse. One good idea is to cover the warts with bandages, but don’t leave it long enough because it can cause a moist environment for the warts. Make sure to always keep your hands dry; it’s hard to treat warts when the environment has a lot of humidity. What is also important is to never brush or shave the areas where the warts are because you can make them spread further. So keep your hands dry at all times.Clothes and towels need very clean and sterile so that in case someone else touches them you know they are safe. Never reuse socks and clothes before washing them. Never try to remove a wart on your own. They are infections that need to be taken care of strictly professionally. Having only one wart doesn’t make your situation less dangerous.You can only cause a further development. Never and that is- never scratch or pick on your infection. It can only result in bleeding, pain, and further spreading of the infection. If you’ve decided to try out the smoke box, make sure to practice general fire safety. Keep your feet away from the smoke leaves. If you notice some negative results during your topical treatment, stop it immediately and ask for professional help. If you are dealing with warts, but you are pregnant Meanwhile, make sure to consult a professional before undergoing treatment. The simplest and safest method if you are dealing is just to wait for them to disappear. If you are not patient to wait for the long process of the natural treatment of warts to pass, you could start looking for some kind of treatment. Whatever method you choose, remember, the immune system is the most important element of treatment. If your immune system is okay, and you take good care of yourself everything will be just excellent. Source: Dr.Axe | Essential Oils Pedia | Web MD | Thought Co | News Medical | Health And Love Page. Duct tape is a good option to deal with warts. It is wonderful remedy for warts and can be attempted at home. I had plantar warts that I had various medications but nothing worked. Then I tried duct tape on my warts. It really was effective and I was able to remove them. Thanks for sharing.